Rocksong Family Mercenary Company Starting Adventure. Responding to the calls for clan the motley group of Trollkin stand together around a small amphitheater in the Rocksongs family holdings. Having trickled in throughout the day none of you have yet received direction on what the Rocksongs have in store for you. As you mill about a youngish looking Trollkin woman strolls up to the group of you with confidence and ease. She carries about her an air of almost nobility and confidence that puts even the most seasoned among you on your heels a little. She begins by singing a popular Trollkin drinking song, except this time something is different, the very air around you seems to crackle with energy and you all feel excitement filling your souls, Brothan even seems to begin weeping. When he song is complete she pauses dramatically and then begins, "I am Ravsa Rocksong, Matron of this clan. We have as of late found ourselves shorthanded and in need of assistance, which is why you all are here, we have a problem getting supplies to some of our folks nearby and need someone to help with deliveries. Should you prove competent we Rocksongs also have been hired by Bloodsong herself to recover ancient Kriel Stones that are too far into enemy territory to send anyone but the most seasoned warrior to get. The pay is good, but the work is dangerous, we Rocksongs have a reputation to uphold. Should you proceed with honor we can gurantee you glory." Other Races would be considered with valid reasons as to why they would be helping with a Trollkin mercenary clan. So here is where I'd like you each to flesh out your characters, as a group. We will be starting with 6xp and +100gc from your starting cash in gear. The Rocksongs have everything you would need at their base operations to fully outfit you, though more exotic items may cost more. 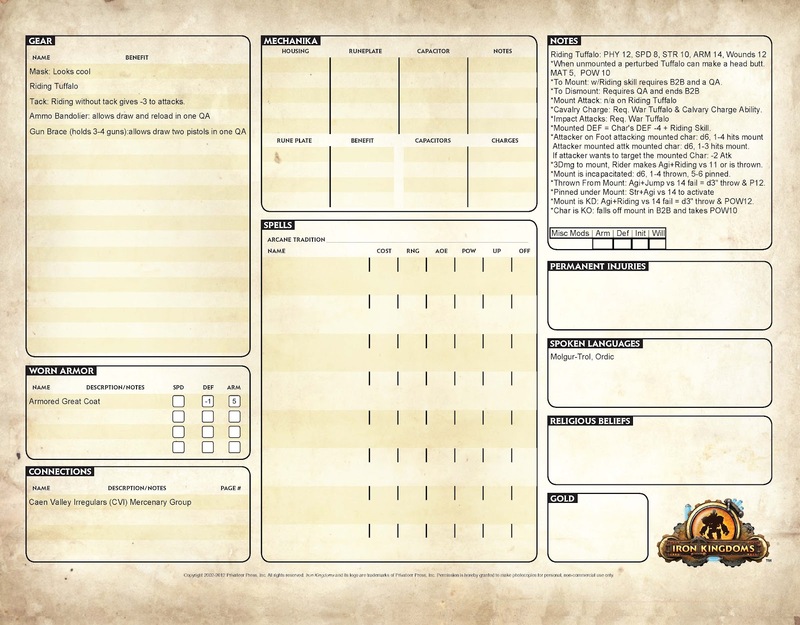 The adventure will be in the wilderness and civilization so the group will need those with the skills to function effectively in each setting. There is need of combat oriented and skill oriented folks. In short, discuss with the group how to finalize your characters. Walking straight up to Boxus, Ravsa clasps the Pygmy Troll in a huge embrace and speaks to him almost motherly, "Boy it is nice to see you again, we have something to show you that I think you might enjoy." Walking the group around the the outdoor theatre the group heads through a very large stables that has nearly a dozen bison and a few horses. In the back of the stables there is a metal shop with a few Stemjacks and other Mechanikal items that look as if they are being stripped down. As you approach the back of the building there is a giant canvas covered item. "We heard you lost your prized steamjack, and though we haven't the means to replace it old Bloodsong had something she was willing to sell us that we thought you might enjoy." Pulling the canvas you all feast your eyes on a slightly war torn and dilapidated but functional looking War Wagon. 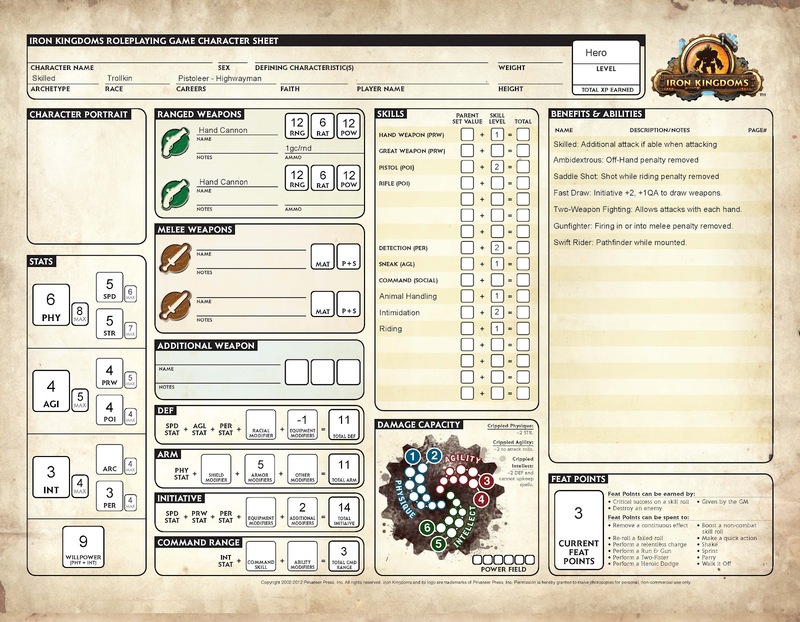 In addition to your normal character creation you will spend some time training together in the use and care of the wagon. It will function as Boxus Steamjack and his drives will affect the wagon His Steamjack gold will be used to outfit the wagon's weaponry. However, there are additional skills that you will each be able to choose that reflect your training with the Rocksongs in using the Wagon as a team. Riding on the wagon Requires Riding skill and will be treated as such while you are on it. There are Five combat locations in the wagon; Driver, Left Gunner, Right Gunner, Artillerist, and Range Finder. You will not be trained in a specific position, however the skills you choose will make your character prefer a certain spot. More can ride in the wagon but during full combat in order to function only five fit on it well. Also, not all of you will be on the wagon... which is fine since some of them won't want to be on it during combat anyhow. In addition to your normal skills each character may choose 1 additional occupational skillpoint in any General Occupational Skill. Each Character may choose One of the following to represent your training with the wagon(this is done after your 6xp character creation). As you level you may use your normal career choices or one of the below. Abilities: Bomber, Cautious Advance, Cavalry Charge, Bull Rush, Combat Rider, Expert Rider, Fast Rearm (Artillery), Find Cover, Hit the Deck, Iron Sentinel, Press the Attack, Relentless Charge, Ride-By Attack, Saddle Shot, Swift Rider. Hold the Reins: You may make a ranged attack wile driving a vehicle at -2 to your attack roll. This is in addition to negatives to attacking while mounted. Obviously some of those will only work if you are the Driver. 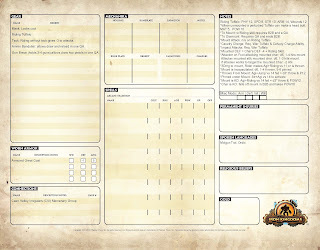 War Wagon Team Training and Your Character Sheet1) Make your Character, and give him 6xp. Level him normally as per the rules in the book. 3) Give your character a military skill or ability from the War Wagon Team list for being a part of the War Wagon Team. This is in addition to your normal leveling. 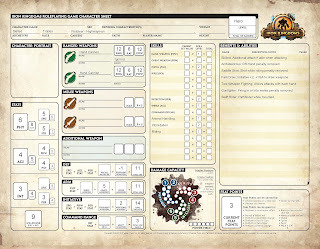 Today we are looking at one of the most chracterful units in the Iron Kingdons, the Gunmages of Cygnar. Gun mages represent a fairly unique type of profession in most any game setting. For the uninitiated, a gun mage is one endowed with the Gift of magic and a predilection with fire arms, most often pistols. Gun mages are able to channel their sorcerous powers into their fire arms in order to achieve a number of effects depending on the gun mage's training and personal style. Such effects include granting greater range, accuracy, the ability to slam their target backwards, the ability to play havoc on a warjack's cortex, or "brain", or to allow a round to violently detonate like a mortar shell striking its target. These gun-toting arcanists have a compelling mystique about them, and are often painted as talented and capable combatants that you wouldn't want to run into in some dark alley in Ord's Five Fingers. The group of Trolls rode with the driver to the suspected location of the Pirate. As they approached the farm and unloaded their steam jack a few pirates in the yard gave them notice to depart. When they didn't immediately leave the pirates opened fire and it began. As the few pirates in the yard began to open fire their comrades began to pour from the building quickly outnumbers the three Trolls. Goris' pistols rang out while Hatred's axe went to work as he lept from foe to foe. Krieg's steamjack walked into the thick of battle as Kriegs spells bolstered everyone's defense. As the Battle progressed Goris' Buffalo became seriously wounded but fought on as Arcanists whithin the pirate crew did their best to stave off the angry Trolls. Just as things were looking up for the Trolls the Pirate boss emerged from the boathouse with two large ogrun at his sides. Hatred rushed the Ogrun using suprise to cutdown one of them before he could fire his large gun. To Hatred's suprise the other Ogrun easily withstood his blow and put him in the ground. Slowly bleeding and out of the fight Hatred could only hope his fellows could save him in time. Krieg stepped up the plate sending his Warjack in to occupy the other Ogrun while he finished off a few of the remaining pirates. As two of the lesser pirates fled for their lives Goris shot down any who remained in his range also taking out another Arcanist. They knew it would need to end quickly or Hatred would be in serious trouble. The Pirate's Handcannon whittled away at the Warjack as his Ogrun severed one of its arms. Krieg fired at the pirate missing him, Goris unleashed a hail of lead but the Ogrun intercepted the shots one some few hitting the pirate. As the warjack began to sputter Krieg was able to get into position to stabilize Hatred. Hatred jumped back into action and cut the bad pirate down where he stood. The Ogrun in defiance for losing the man he was paid to guard charged into the three Trolls who quickly cut him down. Unable to take the Pirate Boss alive they would have to settle for the Bounty for bringing him in dead.. plus Goris got a new gun out of the deal. Now to see if Emmy would uphold her bargain... and not be too upset that one of the workers lost a hand. 1 Hand's left arm below the elbow. Their first trip had them headed to a weigh station a half a day's ride from their Inn. Guided there by a knowledgable driver and his assitant. They loaded their gear and supplies into the cart, tied down the steamjack and headed out to find clues to track down their bounty. Arriving at the weigh station almost made them feel like they were entering a ghost town. A small cluster of buildings stood in the open area all surrounding an official looking building used to catalog each item being transported through. The driver pulled up to the shop and reminded them that the CVI's information led them to this point. The three entered the shop to find it deserted except for the man behind the counter. As Goris walked up to interrogate the man, Hatred walked around the outside of the building, while Krieg inspected the inside. Hatred quickly returned finding nothing in his search while Krieg continued to study a way too clean looking fireplace with... what? Dhunian rune carvings along one side. Krieg, Goris and Hatred met up to take on the world together. From various Kriel around Thornwood they all showed up at the same place to find work... Since work seemed to find them, they jumped right into the action. Physical Description Goris is one of the best with his pistols from the back of a Buffalo. The sight of him thundering guns blazing is terrfying to behold. Crossing him with get you a bullet in the eye or trampled under Buffalo Hoof. Physical Description Hatred is a man among Trolls, always at the front of the action whether it be with his axe fighting enemies or his voice tempting the ladies. He is a force to behold and will just as soon cut you down and go back to drinking. Their first tip had them headed to a weigh station a half a day's ride from their Inn. Guided there by a knowledgable driver and his assitant. They loaded their gear and supplies into the cart, tied down the steamjack and headed out to find clues to track down their bounty. They had just made known that they were looking for work when she found them. Small for a human, with bright red hair and freckles she wore a wide brimmed leather hat with matching pants, a brace of pistols on her hips with two ammo bandoliers criss-crossing her chest. Tiny as she was, she was almost intimidating with the sure way that she walked and the familiarity in which her hands casually rested on her pistols. "The CVI has a job for you Trolls if yer up for it," she said casually in Ordic, "dangerous of course, but the best paying jobs always are aren't they?" Before she waited for a response from them she nodded as if an agreement had already been made, "The CVI will help keep you supplied at discounted rates provided my progress reports on you come back favorably, I'll be traveling with you most of the way... names Emmy!" Archetype Skilled Though Emmy claims to be noble born her last name Valero might not actually be hers. The Valero family has denied her claims publicly and even set bounties on her head. Thus far this has not bone well for the hunters, as each one is publicly humiliated to reinforce her claim, or dead from her pistols. The Mercenary group CVI currently employs her, where she has earned a reputation for completing contracts that others have failed. Emmy is usually fun and jovial but her temper can quickly flare leading her to make rash decisions. The CVI management tolerates her fiery temper and questionable claims of nobility because of her results. She is quick and deadly with her assortment of pistols and has the ability to track and hunt effectively in urban environments and in the bogs of Ord. The CVI currently has her recruiting for a mission they have called 'extremely lucrative' which means it is highly dangerous. This recruiting has brought her to call on old friends, including some from a Thornwood Kriel. Bounties 2000gc alive/ 1000gc dead from the Valero's for various crimes. She held out the contract for them to sign, "kindly make your mark on the bottom line and please include your next of kin so we can notify them in case of... well, in case you do somthing stupid and I have to shoot ya"
The Contract: "You boys ready for some bounty hunting?" she chuckled and absently patted her pistols. "This one's going to be fun!" "I say we take him dead... easier that way don't you boys think?"